Updated: 3rd Feb 2018 — further links added. 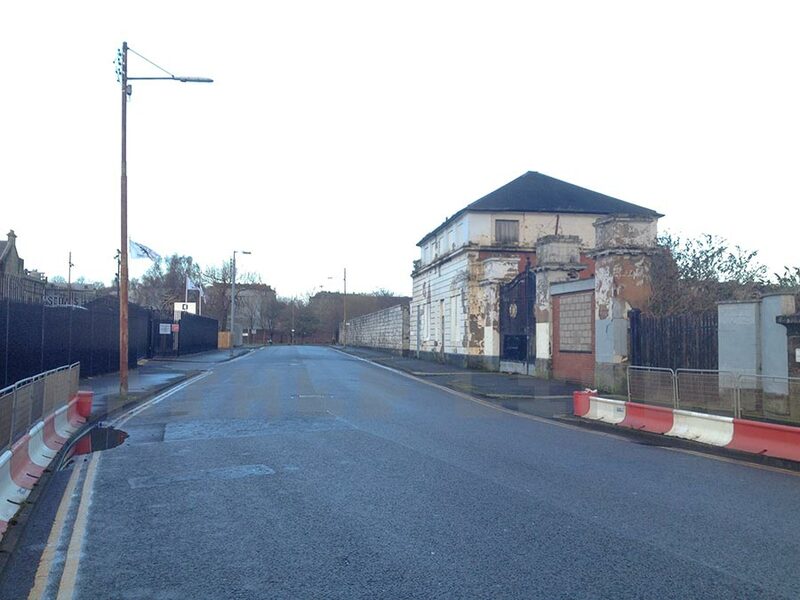 In December 2017 plans were released for the empty site at the corner of Duke Street/Bellgrove Street in Glasgow. 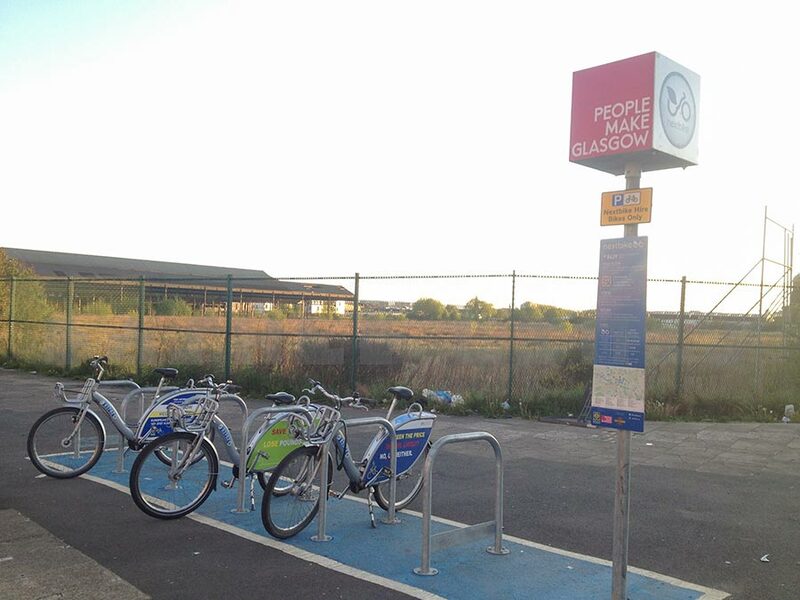 It sits at the north-east corner of Calton on a main route into neighbouring Dennistoun and the wider East End. It used to be industrial land with an abattoir, cattle market and meat processing plants. Seeing ‘Meatmarket masterplan’ on the drawings is the first time I’ve heard it called that. Maybe it’s inspired by New York City’s Meatpacking District? Either way, I don’t think Morrissey will be moving in. In the past, the site was included in plans that linked to Collegelands. It’s the neighbouring site, named after the former College Goods Station and railyard at High St. Strathclyde University built on that site but the eastern part of that planned development fell through. The abattoir site has been empty for over a decade. Apart from a speculative plan in 2014, nothing has happened until these proposals as part of Calton Barras Action Plan. Staff at the consultation event said the cost of cleaning up the brownfield land has put off developers. The new plan uses some of Glasgow’s City Deal money to treat the site and add roads and paths ready for development. One of the developers is a housing association so it should include some affordable homes. The site sits lower than Duke St with a small substation perched at street level. 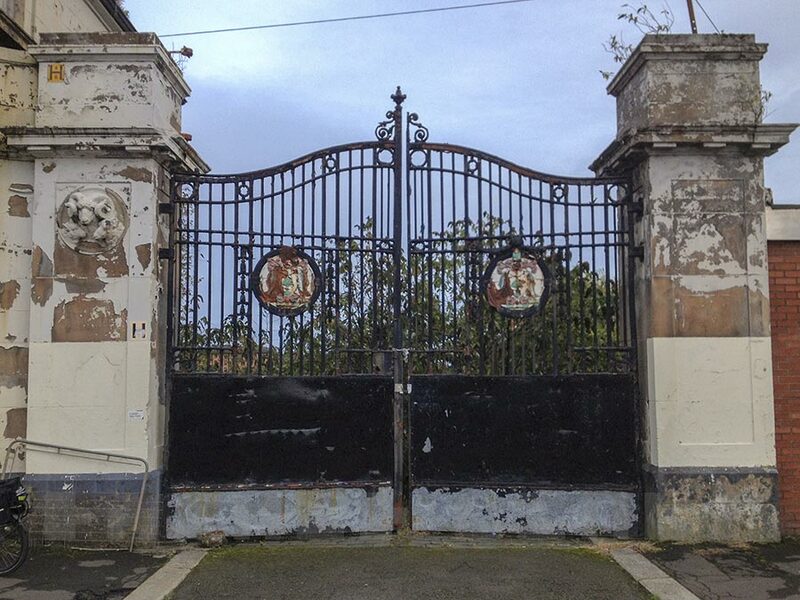 There’s another outbuilding to the west on Melbourne St and an ornate gate. A tall white stone wall runs from here along the north part of the street (part of the old slaughter house). Melbourne St and the empty site continue south over the railway line. 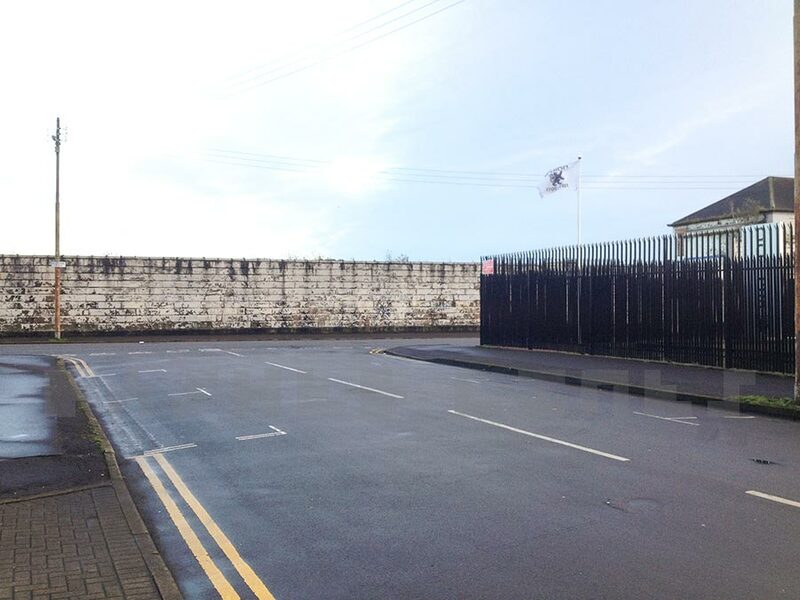 However, the south west corner and the big cattle market sheds have been left out of the Meatmarket site. It might be because of the railway and the sheds being on the ‘buildings at risk’ register. The site does seem to include the old car market site with the black and white archway at the south eastern corner. 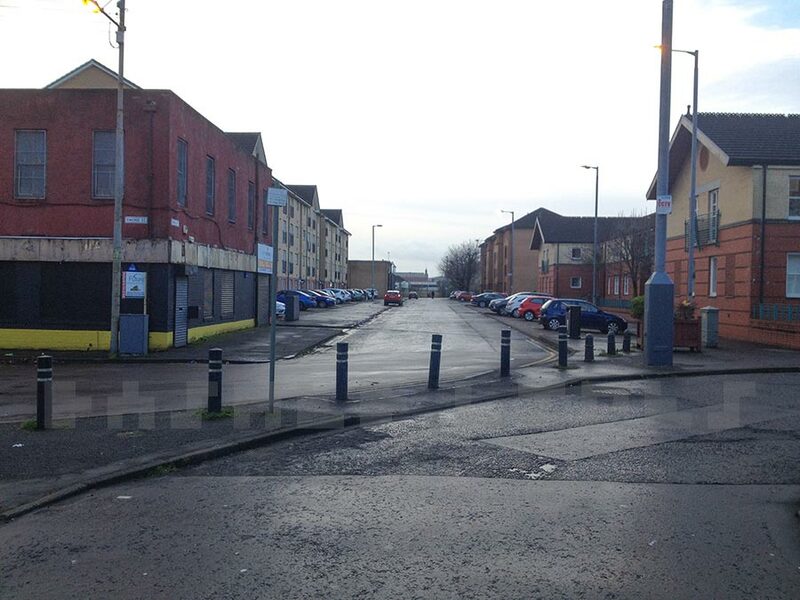 The eastern side is empty apart from an old entrance road that meets Bellgrove St opposite Reidvale St. The planners have ignored the Reidvale entrance but have used the other entrance on Duke St near the north west corner. It brings a u-shaped road over the site of the old cattle market. The second entrance is opposite the derelict Duke St hospital. I think it’s to avoid a straight east-west through road, that could become a ‘rat run’. This road allows in residents and services like bin lorries but isn’t a shortcut. Both entrances are offset from roads on the north side of Duke St (McIntosh St and Lidl’s entrance). These create two sort of staggered crossroads – I’m not sure how they’ll be if cars turn right onto Duke St from both sides at once. The proposed site road has two paths south to the main walking and cycling path. It’s not clear if there are bollards inbetween to keep out cars (there should be). It’s a wide path/street at 8 metres but it’s also shared use. Mixing walking and cycling can be okay on a very quiet path but they also cause frustrations that are familiar to anyone who’s used paths at the river, canal, parks, etc. For example, people walking who don’t realise bikes are coming from behind them, dogs running in front of bikes or people cycling too fast. This is why separate paths for cycling tend to work better all round (as long as they’re clear enough and decent quality). The shared path runs in a straight line across the site between the gate opposite Doig’s coach park in the west towards a plumbing supply depot to the east. No, I’m not sure why they lined it up like that either. However, the eastern end seems to have an extra paved section that vaguely points across the road towards Bellgrove rail station. Also, the consultation staff talked about a future ‘active travel’ path that would somehow make it through all the barriers between the Collegelands and Meatmarket sites. It would then almost link to the winding path south of Bellgrove station (but not quite). That path weaves along some back streets towards the Forge Retail Park (across a busy road). It mostly bypasses Dennistoun, which has many local shops and more people (who’d walk and cycle) . I think the position of the Meatmarket path is a compromise solution. It’s not that obvious for walking and existing paths and streets either side of it meander too much for it to be a main ‘City Way’ cycle route; especially for commuting. At first I looked at how it might be realigned but I think the western wall and surrounding buildings scupper most of that. The sheds are the most obvious line between the winding Bellgrove path and streets to the west of the site. Dennistoun’s ‘desire lines’ to the city centre are straight along Duke St and diagonally across the Meatmarket site from north-east to south-west corners. Part of Hoskins Architects Bellgrove competition entry allowed for that. A diagonal path would take you closer to the Barras. You might think CBAP would want that and to encourage walking and cycling to the market. They’re doing up some pavements around the Barras but there’s no sign of proper cycle lanes on Gallowgate. Their Barras masterplan includes some measures that make things worse for cycling like a ‘median strip’ down the middle of the road – reducing the space for cars to overtake bikes safely (page 13). A simple adjustment to the proposed Meatmarket masterplan would be extending the Duke St pavement a bit further into the site. That would leave room for a segregated cycle path as well as a wider footway. It could be similar to the new ‘Avenue’ taking shape on Sauchiehall St. The key things would be a different coloured surface and tactile/dimpled paving at the edges to make it as clear as possible, even to visually impaired people. This works much better than a painted line, as seen on the Clyde Gateway/EERR shared pavement past Celtic Park, which isn’t obvious enough. This also sounds a bit hopeful – if we’re doing ‘ideal world’ stuff then better to replace one of the four road lanes with protected bike lanes. You’d probably keep two road lanes going west towards the city centre (to keep the right turn lane for John Knox St) but leave one road lane going east. It would mean removing parking at the wee row of shops at the start of Duke St near High St (that usually blocks that lane anyway). There’s a massive multi-storey car park in Collegelands people could use instead. Without a full route, you may wonder why have another short stretch of bike lane that doesn’t link to a network – won’t most folk stay on the road? Some might but even if the lane only went along the top of the Meatmarket site it would keep you away from buses, taxis and could bypass a bus stop. It would also avoid the bit where traffic sometimes ‘undertakes’ a car turning right into Lidl and some taxis have a habit of stopping dead in front of you in the bus lane (answers on a postcard…). I think a segregated lane would be popular westbound, especially with Nextbike users as it would run from the Bellgrove hire station on the corner. Nextbike also has locations at Duke St rail station and Alexandra Parade. A lane right along Duke St would let people cycle into the Merchant City and George Square. A short lane would still get you to Melbourne St – turn down it, along Wellpark St and Barrack St and you can choose to turn onto Havannah St through Collegelands to the High St. It’s not an obvious route on the ground but it’s quieter and flatter than Duke St and avoids traffic lights. Bell St is a bit easier to follow — it goes downhill to Albion St in the Merchant City. Not too many people use these streets to commute into the city centre but they’re useful links. However, if the avenue lane was short and 2-way, using it eastbound would be less straightforward. Sydney St is one way (south) so may need a contraflow cycle lane. Unless a path could be made through the triangle between Hunter St and Barrack St (as in previous plans for the area). Bell St has a short uphill ‘ramp’ going eastbound but I use it fairly regularly. Armour St, near Morrisons car park entrance, takes you to Melbourne St. The other thing I think the Meatmarket plan could use is a path directly opposite Reidvale St. It recently got a second dropped kerb on the west side of the barrier at Sword St. This means you can cycle directly along Reidvale St but cars have to turn (posh name: ‘filtered permeability’). It takes you parallel to Duke St along as far as Bathgate St (but there are barriers to going any further). There are a few speed ‘tables’ on the five north-south streets but I prefer those to dodging potholes on Duke St. They also give better access to shops and housing in Dennistoun than the paths across the tracks. The ideal solution to all this is still the ‘East City Ways’ Glasgow’s Cycling Strategy mentions (but only in passing – p24/26). Protected cycle lanes all the way along Duke St or Gallowgate would be direct, safe and link the centre to local shops and residential areas. It’s happening in the South Side, Woodside and the city centre. Why not Calton and Dennistoun too, as a gateway to the East End? Meatmarket masterplan image © Copyright: Glasgow City Council/Glasgow City Region City Deal, Dec 2017. Scan from consultation handout (differs from final plan at link in article, above). Used under ‘fair use’/’fair dealing’ for discussion.